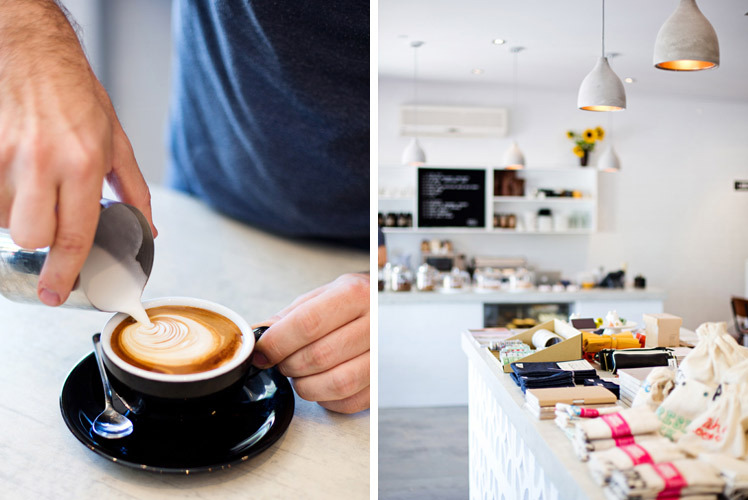 FK chats to Leah of Studio Bomba, shop, showroom and coffee bar, located in Leederville, Perth. Everything you could wish for in a corner store! They keep everyone up to date with their fabulous happenings on their website, and of course, if you are in the area be sure to pop in! 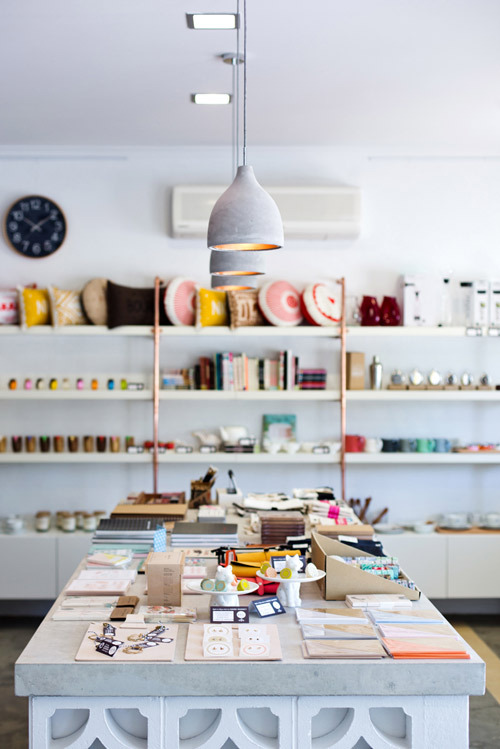 Tell us about your shop and showroom, Studio Bomba and what things we can expect to discover at this marvellous co-op space. Studio Bomba is a like a reverse mullet! It is party up front and business in the back. 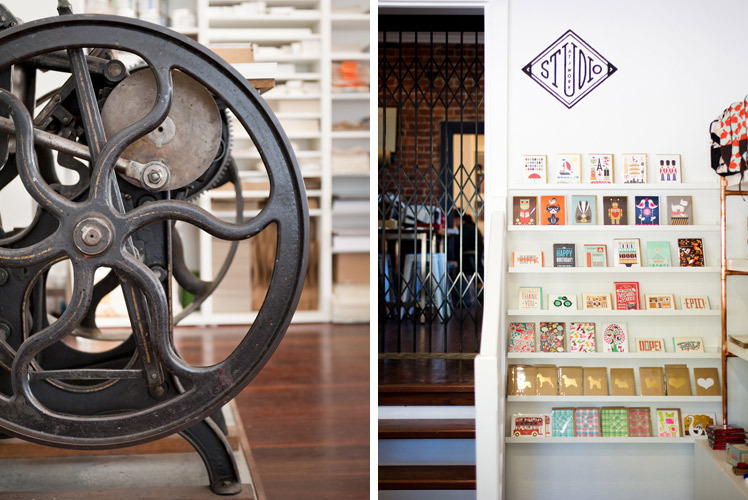 Our co-operative space sports a shop, showroom and miniature coffee bar at the front of a shared design and letterpress studio. It is not in a retail strip, instead we are in an old 1930s corner shop surrounded by people’s homes and we feel like we’re a real part of the neighbourhood. My partner in crime – Angela Mitchell – and I met in the 00’s in the graphic design course at the School of Art and Design here in Perth. We had both studied and worked in other fields before (Angela in fashion and I was a high school music teacher), so we were those geeky gals who like most mature-age students were annoyingly keen and eager to embrace a new-found line of work. We were mutually envious of each others’ work even then and hoped to work together, which luckily we’ve been able to make happen. What kind of goods can we expect to find at Studio Bomba? 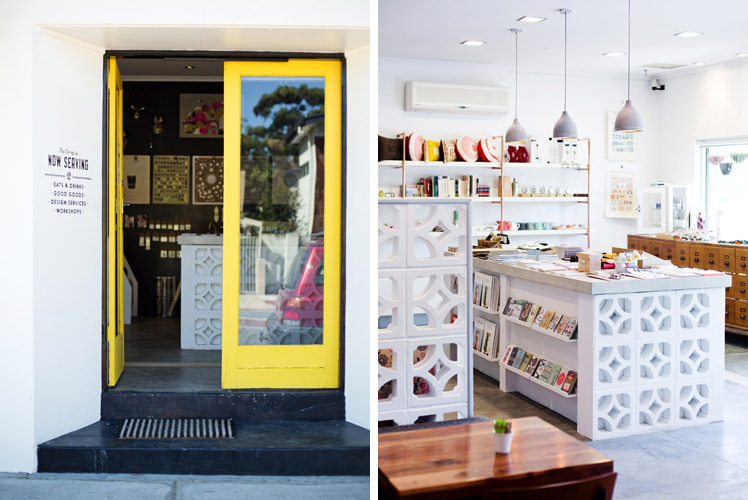 Bomba trades in the good goods – artwares, stationery, gifts, home-enhancing fare and designery knick-knacks. Wherever possible, we really love to unearth independent thing-makers who create products from go-to-woah with happiness and heart in every step of the process. 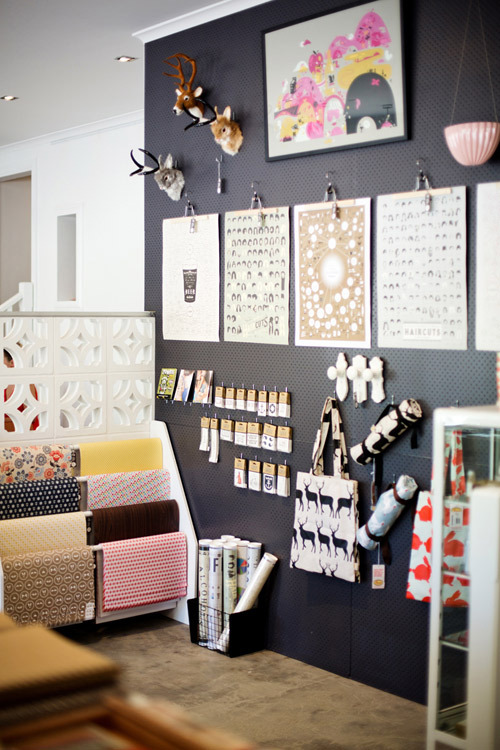 We also stock products made by designers and illustrators here in the studio. What is your inspiration for the shop and studio, and what keeps you motivated? To be honest, we’ve just surrounded ourselves with our most favourite things! As indulgent as that sounds, we do have great faith in the products we sell and the services we offer and we’re motivated by the like-minded folks who stumble across us and then continue to come and visit. What sort of workshops do you run at Studio Bomba and who are the talented people behind the classes? 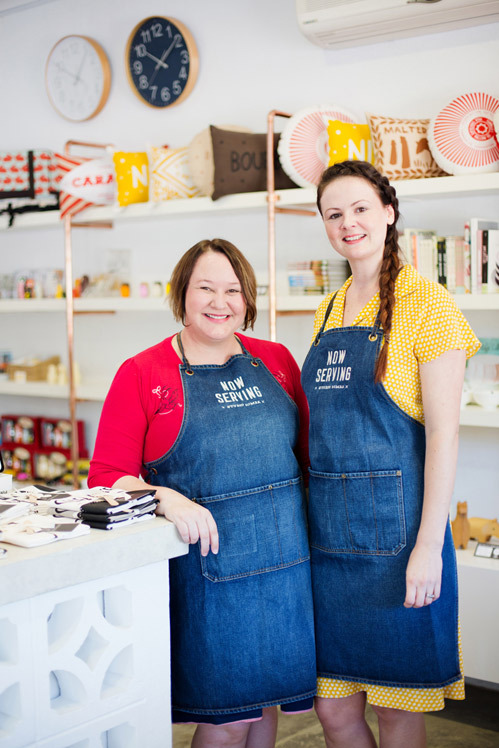 We help curious cats up-skill in all manner of crafty endeavours – knitting, crochet, leatherwork, papercrafts, vintage hairstyling, bicycle maintenance, dip-pen letter writing, flower crowns, wreath-making – whatever we can think of that might be of interest. Angela and I teach some workshops, as do the other creatives who share the studio. We’ve also invited some clever people we’ve admired for some time to come join the fun and add to the skill set. 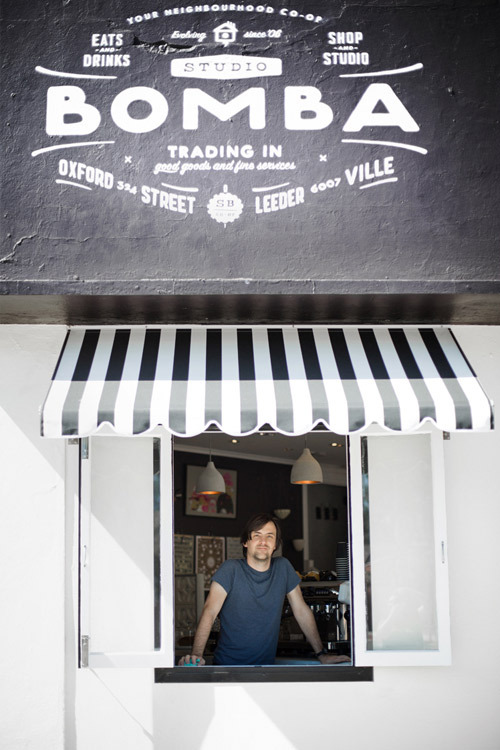 What inspires you about your surroundings and what other aspects about Leederville do you love? The diversity and people-ness of it all. Leederville is not your 4-bed 2-bath curly-culdesac-ed kind of suburb. It is an older, inner-city neighbourhood that attracts people of all ages from all walks of life and that is evident here for sure. Our coffee bar regulars are a living example – we welcome professional couples with a love of long maccs alongside soy-latte drinking young mums next to tradies grabbing caps-with-one before businessmen who look for a quiet corner to work with a pot of tea. Sweet-toothed school students order their grated hot chocs in white after our earlybird Polish neighbour orders three flat whites every morning. It is such a privilege to be a part of people’s everyday lives. We really do need to stop adding new businesses to our portfolio (Studio Bomba, Mitchell & Dent, First Comes Love). Growth and management are not always the best of friends and Angela and I sometimes feel like we’re riding the bus instead of driving it. That said, we wouldn’t have it any other way. It is exciting to be able to make your own decisions and follow through on them. What new plans or aspirations do you have for 2014? Despite what we said a second ago – we have squirrelled away an abundance of ideas for projects and products we would love to design and see come to life. There is so much we’d love to create, but 2014 needs to be a year of consolidation for us. We want to make sure what we have now is all tickity-boo before adding anything new. Somehow though, I suspect we might end up eating those words. We say that every year. wow! gorgeous looking shop! can you come set one up on the gold coast or brisbane?! too adorable!